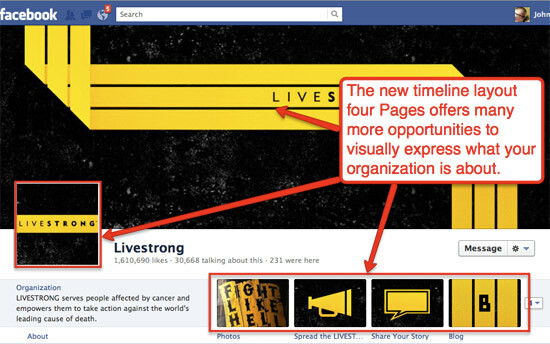 The new Facebook page Timeline layout changes the way your organization needs to think about content. • Custom tabs – The the content strategy for Welcome pages (custom landing tabs) focused on engaging visitors with a clear call to action in mind. For example, Welcome pages encourage users to join and or share a fundraising campaign. They were also used as a way to convert Facebook fans to join your list or otherwise engage with your organization. • The news feed – The content strategy for the news feed focused on engaging Facebook fans in the hopes that greater awareness would be spread through virality. For example, you’d post a photo and a fan would like it, which automatically posts an update on their news feed for their friends to see. The news feed hasn’t changed, and so to some degree your content strategy is still about what’s happening now. But Facebook Pages now make it about the past, present and future as well! 1Your second website – The Timeline allows visitors to your page to interact with a story that has a beginning, a middle and a now. Facebook users can flip through the pages in your story in a variety of ways (as shown below). Now don’t get me wrong – the news feed is and will be where all the action is. But Facebook users will soon start seeing your Facebook Page in the same way they see your website. They’ll visit to see what’s new, what’s important, and what their friends care about. 2Tell a story in your cover image – Think of your cover image as taking the place of the default landing tab (more on that below). The purpose of your cover image is to create a powerful first impression that will convert. 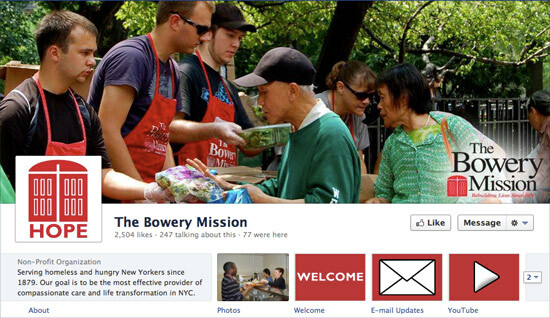 Beth Kanter has put together an amazing collection of orgs that are using cover images effectively. Rotate your cover image. You can keep fans interested by frequently rotating your cover image, communicating freshness, spontaneity and dynamism around your brand. 3Soft sell – Facebook says that your cover image should not be used for calls to action like “Donate now” or “Sign our email list.” You also can’t include any contact information like URLs, or reference any features on your Facebook page such as the Like button.